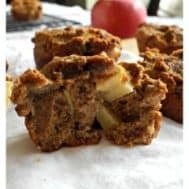 Made with apple butter and coconut flour, these Paleo Apple Pie Breakfast Bites are packed with apple flavor and make a quick, healthy breakfast or snack! 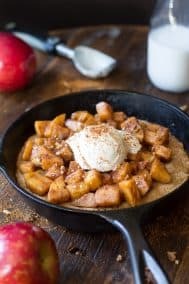 Chopped apples and apple pie spices make these little bites taste just like the real deal. They’re grain free, dairy free, nut free, and Paleo. Surprise! I didn’t work out this past week, at all. Okay fine I stretched for maybe 20 minutes total all week, but, I’m thinking that’s hardly worthy of a “workout recap” post, ya think? I just ran a marathon last Sunday, this is true, but just saying I didn’t run AT ALL or practice yoga or anything feels odd. I’m itching to get back though now, so tomorrow morning, consider me on a date with my headlamp from 6-7am. We (who’s we?) haven’t gone completely mad, though, and priorities are not twisted – when we don’t exercise, we bake, cook, and eat. That’s why so many healthy living and running blogs have something about exercise and eating right in the title – it’s all us bloggers know how to do. And why not? These are the best things in life, at least in G/PG rated blog-land-life. You know my kids read my blog, right? So I say all the right things. 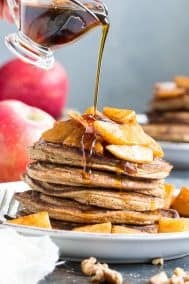 Anyway, I went off on a tangent again somewhere after posting a picture of a muffin, er, I mean a Paleo Apple Pie Breakfast Bite. My kids not only read my blog, but also help me name my recipes, because they seem to have a better sense of the internet at this point than I do. They are all over YouTube Kids watching princess cupcake tutorials so they know what they speak of. Drew (4) actually speaks terms like “fondant” and “ganache” in correct pronunciation. The internet is just completely insane, if you ask me. So, my healthy Paleo Apple Pie Breakfast Bites contain neither of those two fancy frostings, but hey, they were still A-Okay with my family and were gone faster than you can say “pictures are done.” The inspiration behind these yummy little bites was the apple butter that I bought probably two months ago and had yet to open. I guess that’s a small problem with not eating bread – you just know know what do do with apple butter besides eat it with a spoon, which just feels wrong. It can do better than that, and it did, with this recipe! Many times when creating a recipe, I have some sort of “base” that I’m working from. Not the case with this one – I flew by the seat of my inactive-activewear pants for these last Friday. Eggs, apple butter, coconut flour and I took my chances. The results made me happy. 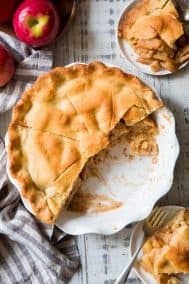 I wasn’t sure what to expect, but, they came out very flavorful, moist, dense but not too dense, and tasting remarkably like apple pie. I’ll happily make another batch with the rest of my apple butter! 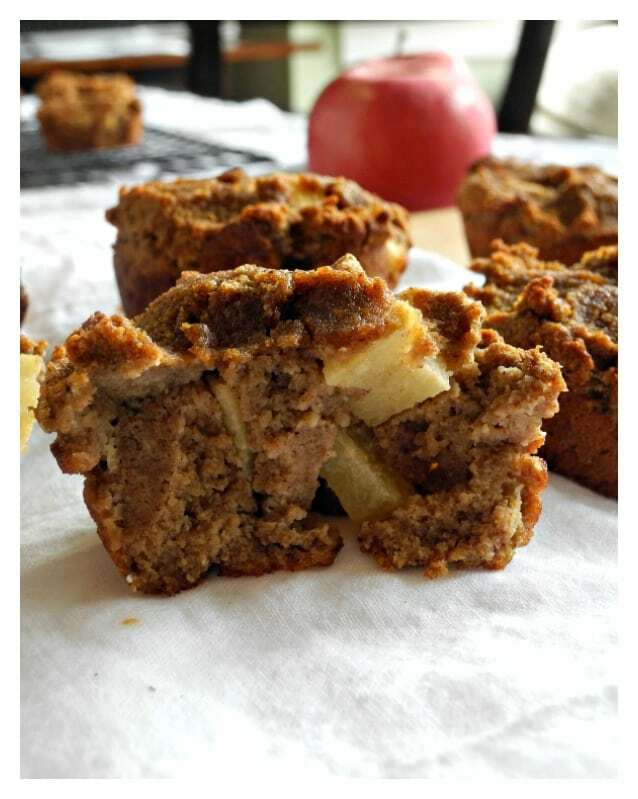 These Paleo Apple Pie Breakfast Bites are moist, filled with juicy apples and the sweet apple pie flavor while also being healthy and filling! Paleo, grain and dairy free, nut free. Preheat your oven to 350 degrees and grease a 12-cup muffin tin with coconut oil. In a smaller bowl, combine the coconut flour, tapioca, baking soda and salt. Stir the dry mixture into the wet until fully combined, but don't overmix. 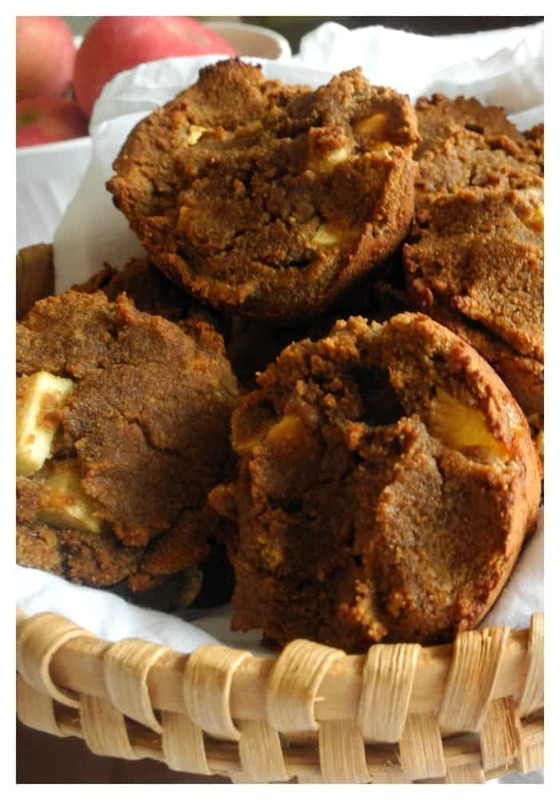 Coconut flour is dense and will create a thick muffin batter which is normal. Lastly, gently fold in the chopped apples. Fill the greased muffin cups 3/4 of the way up - these will not rise much in the oven. Bake in the preheated oven for 25-30 minutes or until a toothpick inserted in the center comes out clean. Enjoy! These can be eaten warm or stored, covered in the fridge for later use. Recipe posting always makes me hungry. Better go eat some apple butter straight from the jar! Maybe I’ll swirl it with cashew…that sounds sort of amazing. And this is how recipes are born! Did you eat anything from a jar this weekend? Are cooking, eating, and exercise your favorite (g-rated) things too? I forgot about sweatpants. Is wearing sweatpants a legit activity? I want it to be so badly. “Sweatpanting” – I like that. I would say that eating, running, and sweatpanting are totally on the top of my list of favorite things to do. I hope you enjoyed your week off from working out! Its always good when you are itching to get back to it after some time off. LMAO at the FLYING BY YOUR SEAT. And here life is always from a jar. Fingers or spoon, all good! What didn’t I eat from the jar this weekend? It was one of those types of weekends. Apple butter is so amazing. I was going to makes some with our Michigan Apples, but lo and behold, we have FINISHED them!!! I am so impressed with us! Lol, I just picture you surrounded by jars 🙂 And the apples go quicker than you’d think! The best ones are the ones we all enjoy! Yum! I’m a big fan of Apple for dessert as you know. I haven’t eaten Apple butter out of the jar but a good nut butter happens a lot! Love my sweatpants 🙂 Peanut butter straight from the jar, every day! 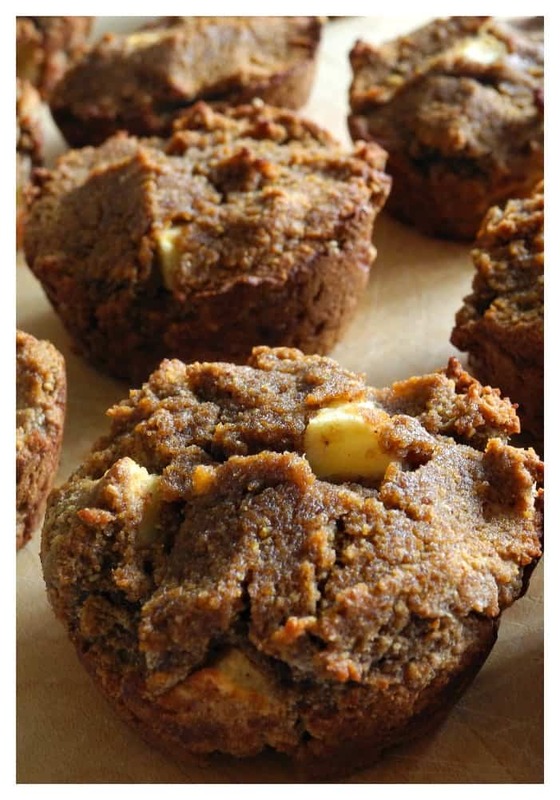 Sweatpants and nut butter sounds amazing right now! I fully support the addition of “sweatpanting” to the dictionary. Add napping and those activities describe my life (kind of, at least ha). I ALMOST bought apple butter yesterday. Curious how it tastes! Napping is so hard for me but I wish I could! And try the apple butter! Apple butter is everything. Thanks to you and your blog, I ate sunflower seed butter from the jar multiple times this weekend! This look so good, I can’t wait to try- especially since they have nutmeg! Lol yum! And I think you’ll like these! Weekends don’t need to be civilized 😉 I love my inactive workout clothes more than my real running clothes! Can I add video games to favourite G-rated things? Because those would definitely be in there as well. I thought I’d grow out of those suckers at this point, but they’re still one of my favourite ways to unwind and destress. But baking is definitely up there as well. These sound delicious, Michele! I love the presentation in the basket 😉 Like apple picking 2.0 and the apples transformed into muffins 😛 SURPRISE! I guess those are the g-rated things, you know what I want to add to that….coloring! This whole coloring takeover that’s been hip in the last few months. I usually do color this time of year in my kiddie holiday coloring books from like 1999. So fun! I need to find them…..
I’ll support you if you want to make “sweatpanting” an activity! With this weather and time change, I’m living in my warm comfy clothes all the time. Speaking of, should probably change into my real workout clothes because I have a Body Pump class to take in an hour! Ha ha! You’re hilarious. Sweatpanting sounds exhausting! Thank you! And yes, start baking! “To Sweatpant” yup, works for me! Glad you enjoyed a week of rest and recovery! Eating and cooking are my favorite activities as well in addition to exercising, and I also love to read, especially if I can eat while reading or am reading about running. I’m not very diverse in my interests I guess! I love reading too, but don’t do it enough lately. Partially because I tend to fall asleep reading! Wish I could get into puzzles but my patience lacks! One of my daughters is better with them than me at this point.